Whether your need Home Automation, Condition Reports or any of our Electrical Services, our experienced engineers will provide the highest quality solutions. With years of installing air conditioning systems under our belts, we can fit yours in as little as a day. We won’t just install your system, we also service and maintain them to improve their efficiency. For every home or business, being able to protect your property and the people in it is the most important thing. From Home Security systems to Access Control, Celsius can meet all of your Security Needs. From Heat Pumps to air conditioning, our heating solutions provide you with affordable and highly efficient solutions, tailored to suit you. In need of some quick DIY help? Take a look at these 'how to' guides and see if they help. We've been trusted for over a decade with everything from PAT Testing to professional outfitting, no matter how big or small your needs, we have the experience and expertise to solve your problems. Home » News » Hot Under the Collar! The second phase on reducing Dyfed menswear’s carbon footprint and energy bills got underway last week. 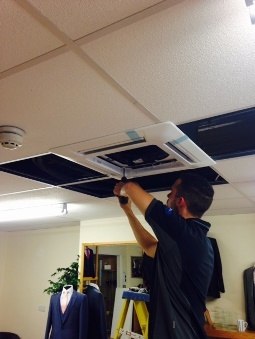 With temperatures reaching a hot 30 degrees inside the shop, Celsius have been busy installing Air conditioning to both reception and fitting rooms. Using our Fujitsu cassette split system, we were able to deliver 8kw of cooling to both rooms reducing the temperature down to a cool18 degrees. Not only will this system benefit the staff during the Summer months but will also act as Heating during the Winter months! Here you'll find latest news and updates from Celsius Installations. Whether you're looking for updates about our services, stories from our customers or news from our team - you'll find it all here. If there's anything in particular you'd like to find out about, just give us a call or drop us an email. Electricians serving Carmarthen, Llanelli, Swansea, and across Carmarthenshire and Pembrokeshire.